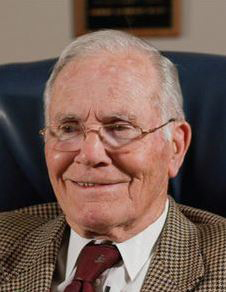 April 28, 2017 — Richard "Racehorse" Haynes, a 1956 graduate of the University of Houston law school who became a courtroom legend representing defendants in some of the highest profile murder cases in the state, died today at the age of 90. Known for his courtroom theatrics — he once shocked himself with a cattle prod to show that, while it hurt, it wasn't deadly, and threatened to drive a nail through his hand to show it wasn't all that painful — Haynes was frequently named one of the top criminal defense lawyers in the country. During his nearly six-decade career, he represented 40 clients facing capital punishment; none was executed. Among his cases was the defense of Dr. John Hill who was accused of killing his socialite wife, Joan. The trial ended with a hung jury and the surgeon was killed in his River Oaks mansion before a retrial. Haynes also won an acquittal for Fort Worth billionaire Cullen Davis, at the time the wealthiest man ever to be tried for murder, and Vicki Daniel, accused of killing her husband, Price Daniel Jr., former speaker of the Texas House. A Houston native born April 3, 1927, Haynes earned his nickname after a coach at then-Reagan High School described the way he zigzagged down the field as running like a racehorse. A U.S. Marine who fought in the Battle Iwo Jima during World War II and a paratrooper during the Korean conflict, Haynes decided on a law career and chose UH because he heard everyone in the first graduating class had passed the bar. Drawn to criminal law, he took Professor Newell Blakely's evidence class three times, once for credit and twice auditing, to learn all he could about the field. After graduation, he started a practice with a classmate in what he described as an 8-by-8 foot office on Main Street so small that when he had a client, he had to ask his partner to leave the room. Haynes is survived by his daughter, Ricki Haynes, and sons, Jason Blake Haynes, a 1989 graduate of the University of Houston Law Center, and Slade Haynes. He was preceded in death by his wife of more than 60 years, Naomi, and his daughter, Tracey. A memorial service will be held at 1:30 p.m., Thursday, at the First Baptist Church, 7401 Katy Freeway.